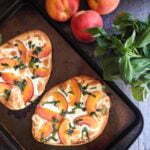 This easy peach & basil flatbread is perfect for those ripe peaches in season as well as herbs from the garden. A quick and tasty summer meal. Mix oil and garlic in a small bowl. Brush the oil mixture over the naan bread. Place the bread on a sprayed cookie sheet. First add your slices of mozzarella. Then place your sliced peaches on top. Sprinkle salt and pepper on both naan breads. Bake for 25 minutes or until the cheese is brown and bubbly. Sprinkle basil leaves on top. While the flat breads are cooking, add the vinegar to a small sauce pan. Bring to a boil and then lower to simmer. Cook until the vinegar reduces and becomes a bit thicker. Drizzle the vinegar over the cooked flatbreads, cut and serve.